And ROTFLMAO at the posts my husband has done in my absence. I'm afraid now that you'll want him back instead of me. And feeling great. I do want to thank you all for your prayers and positive thoughts. The surgery and recovery, to date, has been nothing short of spectacular. I give credit for this amazing recovery because of the the prayers offered on my behalf. I knew before that prayer was powerful, but to actually experience it first hand, well, there are no words to describe what a difference it has made in this journey. The surgery was a huge success as I imagine you all know if you've been reading my blog while I was away. The doctor thinks what I'm able to do, even at this early stage, is phenomenal and that's his word! The physiotherapy has been great. Not once did I 'scream like a baby'. In fact, I have less pain now than before the surgery. I think of pain as that sharp, biting, quick as lightening strike. What I have experienced since the surgery is minor discomfort and muscle stiffness, all of which will disappear over the next few weeks. During the physio sessions, when it got a little bit tough, I would chant, "I'm not wasting those prayers, I'm not wasting those prayers" and would call upon God to get me through. Never once did it get to be more than I could handle. Again, all this is due to those prayers and well wishes. If I could give each and every one of you a personal hug, I would gladly do so. However, this message is the best I can do for now. So, here I am, at home, and need to know what important things have transpired during my absence, especially if it involves new stamps and stuff. Please, fill me in! My last post as substitute GrammaStamper; where do I begin? I suppose I should tell you a bit about GrammaStamper and me. 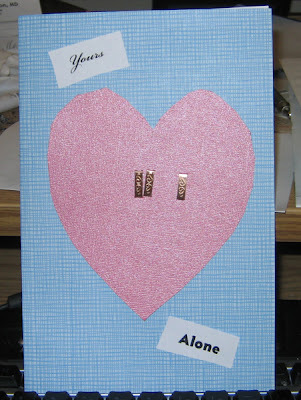 She, of course, spends much of her day making cards, provided ‘Coronation Street’ isn’t on. I have left the craft room pretty much as she had it prior to her surgery. She likes it that way and I’m really not allowed in there anyway. Of course I cleaned it while she was away; that goes without saying. 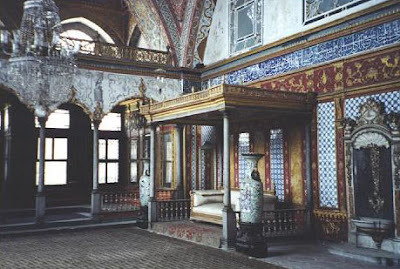 As usual, every week I wash the floor, dust the chandelier, and keep the pillows properly ‘fluffed’. Her craft room is shown, left. I have my desk in area in the back of the house. It’s a wee bit smaller than hers but I don’t mind. I get enough light as there is a window right beside me. (Actually the word ‘window’ may be incorrect as there is no glass there, just a hole in the wall which I board up when it rains.) At night, sometimes she gives me a candle so I can continue working even after the sun goes down. I usually wear my ‘hoodie’ as it can get chilly in there. We have considered heating it but I’m told it would interfere with her purchasing stamping supplies. Besides, you can’t really tell by the picture, but Hank is sleeping in my coat and he helps me to keep warm. You may note by the picture that I do not have my own computer, just the quill you see. Doing these posts is fabulous as I have been using her computer to post all these messages, and her room is heated. (And I know Hank’s been in here as there are toasted mouse-parts on the floor. I assume he had a party or something. Of course, I’ll clean it up before Barb returns.) Eventually we might get another computer but I’m told, again, it would restrict stamping purchases so I don’t mention it anymore. The same goes for socks and shoes, which is why I like the full height of my desk. I am so looking forward to tomorrow when Barb returns. I’m not positive if she’ll post an entry in this blog right away but I’m sure she’ll make herself known. She hasn’t had the use of her computer for over two weeks and I’m sure she’s suffering ‘withdrawal’. And besides, I might be allowed to have one of those Golden Chips I got for her, assuming some fall on the floor. Well, that’s it for me. The next entry here will be GrammaStamper’s. I really loved the opportunity to do this and love the way you all have supported her. My warmest regards to you all. As my penultimate (That’s not a word I get to use often so I’ll take when I can!) posting as substitute GrammaStamper, let me say first that everything is going great. Barb has had her stitches removed this morning and has accomplished some independent walking, simply pushing the walker ahead of her and walking towards it. Again, she sends her thanks for all your support. I said everything was going great and that’s true … almost everything. Heather Grow saw it coming. Heather Grow understands the signs of the universe. Heather Grow is a modern Oracle, a sage to be heeded. Upon reading my post about getting chips for Friday, she commented “You might want to have some chocolate on hand too”. Now, you know I’m a man, knowledgeable in all things technical, the sciences describing the stars and the planets and in the art of numbers. This, however, does not include understanding those amongst you without the “Y” chromosome. Some of you may know I am disabled and so this quest was dangerous and fraught with peril. I planned my every move, assembled a crack team of my most trusted allies and prepared for my journey. Being a man of action, I commenced immediately following my post and so had not yet read the sage advice of Heather Grow. I was focused. I conquered the intersections, the hills and the parking lot. I met the challenges and captured the Golden Chips. So it was said; so it was done. At the lair of the Golden Chips, ever the thinking man, able to anticipate the unexpected, I also captured the fabled Cheetos and would hold them as a trophy for my troubles, perhaps gaining extra favour with my master for my foresight. However, during my quest, no one said “perhaps you should get chocolate too”. Perhaps the sentry perceived that I was a man on a mission and not to be trifled with. Perhaps my crew did not recognize the dark omen lurking in the dim light behind the packages of mixed nuts. Perhaps the reason will never be revealed. Upon returning home, I secured my treasure and, tired after the journey, rested for a time. My crew disbanded and I was again, alone, but contented. I felt the heavens open and beheld a vision. The slain heroes of our ancestors were looking down at me, shrugging their shoulders. “Huh?” said one. “Go figure” another said. “Poor guy” said a third. Alas, there were no answers to be found there. For a fleeting moment, the world was perfect and it was mine. But it is written, “Pride cometh before a fall” and so it is right and just that I make penance for my faux pas. We will have no chocolate when we are reunited. It is as a cart without a wheel; a horse without a saddle; a woman without chocolate. But all is not lost. I will persevere with my studies and meditations on the meaning of the double-X chromosome, striving for the illusive answer to the ultimate question. Torsten, a German student I met in PEI, told me a story about family that I cannot forget. He was referring to his in-laws coming to visit and he said “Family is like fish. Very tasty for the first few days but after a week, it stinks”. I’ve always liked that because it seems to ring true more often than not. For some, the time frame may be shorter or longer, depending on the company. But, I think it really reflects how we deal with personal disruption. I can go a week, no sweat, on my own, but after that, it stinks. I am looking forward to seeing Barb here, to seeing Tiffany who I haven’t seen in too long a time and to sitting in the same chair I am now sitting in, doing the same things I am now doing, but knowing there is someone else nearby, able to chat whenever there is something to chat about. I banished myself to the laundry room today. No point waiting until she makes me do it anyway. Almost everything is working just fine. Apparently we’re too far from the grocery stores to get delivery. That means the Little HM will likely stay in the hospital until Saturday. That’s when her daughter, Tiffany, arrives. She’s doing fine and talks of ‘discomfort’ when doing her exercises. That’s better than ‘pain’. 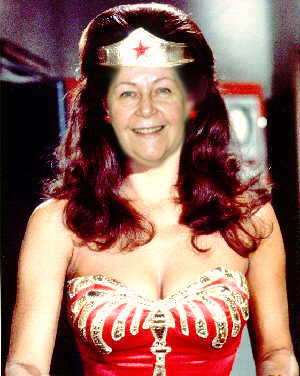 She would have truly been Wonder Woman if she just breezed through this. Darn! I guess you all have finally figured out this grand charade. The meek and mild GrammaStamper is actually WonderStamper! I knew it would get out sooner or later. And as for my card, many thanks for your kind words. It is evident that you all can do things which I can’t. I am really impressed with the cards you’ve sent to Little HM. I may be able to work around the keyboard, but there’s nothing like the feel of the real thing. When Little HM returns, maybe I’ll team with her to get that done the way my mind had it. If not, know that it is sincere, even if not quite ‘hand-made’. Big HM was gone most of the afternoon today. He says Little HM is doing fantastic. She walked all the way to a room with a computer but the internet wasn’t working; otherwise, she would have said hello to all you shackies herself. The surgeon came by today and was duly impressed as well. He said he hadn’t expected to see as much flexibility improvement ever, let alone so soon. She gets in/out of bed fine and, while some accommodations are still necessary, she is now classified as “ambulatory”. She is considering coming home early if a few things are put in place. Big HM took measurements of the heights of chairs and beds so she’ll show that to her occupational therapist on Monday and we’ll see from there. As a bonus, the weather here is terrific, at least considering the cold-snap that has lasted most of the month. It’s still a long way to Spring but perhaps Winter’s worst is behind us. Obviously, the big light-show and loud music of the Superbowl cannot be reproduced here; somewhat smaller budget you know. So, in lieu of budgetary restraints, I’ll tell some of my favourite jokes. Ahahhahahahhahahahaha …. I love doggie jokes! Q: What do you call a doggie with an IQ of 23? There was a doggie, a cat and a budgie taking a plane ride when the engines flamed out. The plane lost control and everyone realized this could not end well. The doggie, sensing a crash was imminent, and preferring to take his chances, jumped out the door, but without a parachute, plummeted to his death. The budgie also jumped out the door, but since he had not been clipped since his last moulting, flew gently down to a tree whereupon he knelt and gave thanks for his miraculous escape. The cat, looked around, assessed the situation, repaired the engines, flew the airplane to a nearby field, and landed safely … then ate the budgie. Well, that was good. There’s nothing wrong or anything weird going on with Little HM … this was just the intermission. I made a card … sort of. 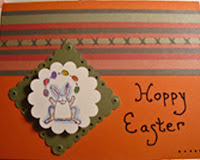 I tried (really I did) to make a card by hand but I just couldn’t find any of the things I needed in Little HM’s (Gramma Stamper) craft things. Okay, so here’s the idea of what I was going to do. Maybe someone out there could do it right and send me a picture of the way it is supposed to be. Type out all the names in PhotoShop using a 45° angled rectangle text bounding box, just like the actual picture above. Then, reverse the horizontal (mirror) and print it out on vellum. Mount it backwards to make it correct again (because it is now be on the back of the vellum). It will appear somewhat diffused, much like in the picture. Mount the reversed picture on some nice textured paper, preferably dark blue. 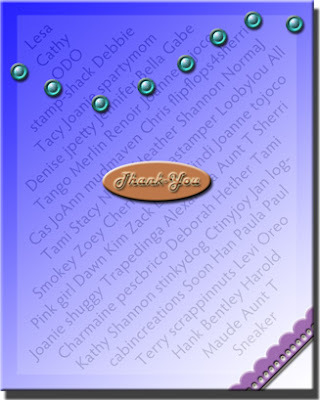 Mount a plaque with the “Thank-You” sentiment on it in the centre. An actual plaque with “Thank-You” would be ideal but “Thanks” would be fine too. Likewise, a blank plaque with the “Thank-You” stamped on it would be fine as well. Now, take a ribbon and mount it in a nice place (maybe the plaque you use is mounted with ribbon). Multi-coloured ribbon would be best but I did manage to find pre-cut bows but without the plaque, this just wasn’t enough. Depending on the size of the bow/ribbon another embellishment or two is called for. I found some lovely heart brads which would have worked fine as the bow was rather small and the card needed some balance. Now for the challenge: Make this card and take a picture of it for me! Send the picture to Gramma Stamper’s email (in her profile on this page) and I’ll post it in the next day’s entry. Remember, this card is for you so whoever makes one can display it proudly and say it came from the best looking cat in Thunder Bay. You can even put it in a self-addressed envelope and collect it with your mail … I’ll never tell … just don’t put a stamp on it. And if you really go nuts, the inside should say “Thanks for the many thoughts, wishes and prayers and for making Gramma Stamper’s stay in the hospital much easier”. Sign it with my paw-print and under it you can put “Hank – for Gramma Stamper”. But all that is optional. As for news on Little HM, there isn’t much. She’s having a bit of a down-day with some discomfort and some just plain wishing it was over. She has had comments on the wonderful flower arrangement Cathy sent her and wants to give a special acknowledgement to her. Last night, Big HM gave me some ice-cream. I LOVE ice-cream. I LOVE my Big HM. Well, we’re almost at the half-way point. Nothing much to report today. Little HM had physiotherapy this morning and the physiotherapist (try saying that three times fast) said that Little HM was better than yesterday and that every day should be better than the last. Last night Little HM got all mooshy talking about you all and the cards and emails she received. As you can see by this blog, things are going much better than everyone expected and she gives great thanks. Maybe I’ll make a thank-you card for you all and post it here tomorrow. Anyway, he says her bandages were off and he saw the surgery marks; they’re a foot-and-a-half long and have staples every quarter inch or so. (Does this mean the surgeon used embellishments?) Big HM did take pictures of her legs but the pictures are so gross, I don’t think you need to see too. Today was her first day of physiotherapy. She did well but said it hurt a bit. Later, she managed to walk all the way to the lounge/dining room and back. She was pooped but she did it. She thinks maybe there is a computer there so she may rejoin her stamp sites sooner than anticipated. Big HM says she’ll stay until March 1 only because that’s when daughter Tiffany arrives but otherwise she would probably be discharged earlier as she is doing really well. She’s just moved tonight to another room: 308(1). Well, now that Big HM is back, I think I’ll see if he has enough energy to play “jump-on-everything-until-stuff-breaks”; my second favourite game. Well, it’s been a pretty exciting day for me. I learned how to turn the clock radio alarm on. It was set for 5:00 a.m. and Big HM couldn’t figure out how to stop it! You should have seen it! I laughed so hard I almost needed stitches! I was going to try to turn on the radio part tonight but somehow, it got unplugged. I’m sure Big HM will fix that when he sees it. The second thing is: I created a new game! I call it “Xtreme Rodeo”. (Note the spelling; that will be good for marketing purposes.) The object is to run along the back of the sofa and then, using a Hairless Monkey’s head for a springboard, launch yourself to the next piece of furniture. Talk about a rush! You can’t estimate the position of HM’s head at point of contact because it moves all over the place; and it’s tough to concentrate on your landing spot with all that yelling going on but let me tell you, it’s worth it! If only I had some catnip, it would be like Olympic snowboarding! There is one drawback though: DO NOT ATTEMPT THIS TWICE IN THE SAME DAY! It could mean an immediate banishment to the laundry room for a ‘time-out’. And that’s the voice of experience speaking. I suggest spending the rest of day playing ‘push-stuff-off-the-counter’ or any other ‘low-risk’ game. If your HM is fast, try waiting at least 20 minutes between sporting venues. Little HM is now at St. Joseph’s Hospital. She’s in Room 320(4). She had a good ride over from TB Regional and the attending nurse gave her a hug and said she was a good patient. She also saw the surgeon today. He told her that her left leg was so bad he considered postponing doing the other leg as it was exhausting for him. We’re so glad he finished. He also said she’s doing phenomenal and her blood count is back up too. There’s a small bonus at St. Joe’s too: TV is free! That should offset the extra taxi fare Big HM has to pay to visit her. Well, I have to get going now because Big HM is coming to use the computer … and if he sees I can type he’ll start asking for all kinds of things. And then I'll never get a moment's peace! There was a minor turn today. The Little Hairless Monkey had low haemoglobin and so had to get some blood. While this was certainly not wanted, it is apparently a common post-surgery occurrence. She is still going great on the CPM machine and has had many steps to and from her litter box but is understandably tired. Big HM talked to her just moments ago and she’s fine again but has postponed the trip to St. Joe’s until tomorrow. Tomorrow is a new holiday here and so things will be quieter anyway. It’s about time we had a holiday mid-winter as we ‘northerners’ suffer through short cold days from New Year’s to Easter without a break. Not that it affects me too much of course, but having unhappy attendants during the winter months has always been a problem for us cats. Perhaps even the dogs feel this it but since they have ‘masters’ and we have ‘attendants’ I think they might not be bothered as much. I did another card for her today. She sometimes makes two or three in a day and I don’t know how she does it. This one is all done on the computer and is nice and simple. I like simple for two reasons: it gets right to the sentiment without distractions and also because I don’t want Little HM to feel inferior. You do believe me, don’t you? All you stampers should pass this along to your Dough-Heads: Big HM said he’ll never complain about the money Little HM spends anymore as you all have added something which money can’t buy. A chin-rub to you all. Yes, Big HM went out visiting his mate. He came back and told me she’s doing great. She has good colour (although his idea of “good colour” is one-tone whereas I feel that a minimum of two colours makes you cool.) He said she’s using her continuous passive motion machine for 3 hours each leg at 90° and she will be doing 120° tomorrow. She’s also is no longer taking special pain pills. And all this after only 3 days! She definitely must have a feline constitution. She’s read all your emails and is thrilled and thankful. She wishes me to send a special thanks to all of you, even the canis lupus familiaris ones. She’ll be moving to St. Joe’s tomorrow. She will stay there for about 2 weeks and then it’s back here. I’m looking forward to seeing if she still gets all excited when I jump on her knees in bed. Seriously though, I never mean to hurt her but it will be good if she just accepts my surprises as part of my bubbly personality. I didn’t do any cards today as I was too busy with cat-things, like sleeping, grooming, napping, eating and snoozing. In fact I never got to my siesta so I’m going right now to avoid getting behind schedule. See ‘ya tomorrow! Big HM knew but never told me! I only found out because I found the card he made for Little HM. It’s really very simple and not up to my standards but he did manage to use some fancy staples. I laughed when I saw where he put them though … he’s got no idea of how to use Little HM’s tools … and it looks like he used his teeth to cut the paper! Like I said before: I think he answers why we sometimes eat our young. I know Little HM ‘stages’ photos so I tried too. I think she must use a better backdrop though. 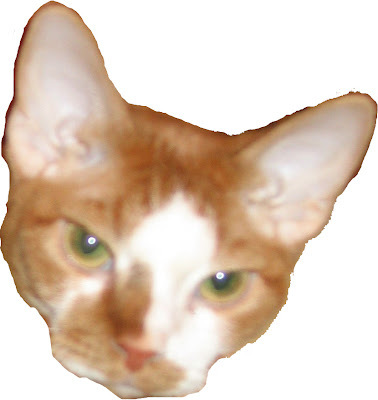 The inside of the card is too mooshy to print here … almost made me cough-up a hairball. Anyway, dogs can come but I don’t think the mouse-kabobs would be to their liking. And tell them not to slobber … we know where that slobber has been … yuck! But no squirrels! Too distracting; they wreck the party! Little HM actually made a few steps yesterday. And today she’s on a continuous motion machine that moves her knees 0-60°, one at a time, for 1½ hours each. Again, she’s in high spirits and is now taking pain pills as required rather than the shots she got post operation. Big HM was going to visit her today but is having too much trouble so your emails will have to wait till tomorrow. There is some difficulty in getting a bed at the other hospital so she’s staying at Thunder Bay Regional at least one more day. Her doctor promised she would not leave there until she either had a bed at St. Joe’s or was ready for home. Big HM hasn’t done anything yet today but is already exhausted so I’m going to sit with him awhile and leave the computer. Keep all those prayers coming … they’re working! Big HM talked to her this morning and she was amazingly alert and ‘up’. She must have a cat’s constitution. At this rate, she’ll be chasing birdies in no time! 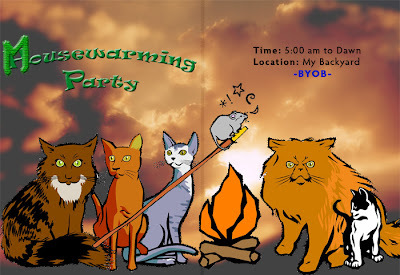 While Big HM was sleeping, I took the opportunity to make this card for my party. Other than the wonderful likeness of yours truly, everything was available in her stuff. Below is the front of the card and below that is the inside. For the inside, again, everything was available but the stick is actually part of Father Christmas’ staff with the old guy blocked out. Clever, eh? The background is computer generated but if I could get a similar paper; that would have been fine too. I had to alter one stamp but hopefully you won’t notice … it turns out her ‘sayings’ are limited and not ‘cat-worthy’. I see from previous cards that ‘embellishments are important, but you know what? No mousie brads or anything! I asked Big HM to go out and get a real mousie to nail to the front but he just looked at me and said he’d get breakfast soon … what a goof! I even brought him one of my toy mousies to give him the idea but he just ignored me and went to make coffee. Sometimes, living with HMs can be sooooo frustrating! So, my card will be without embellishments but I hope you don’t think less of me. GrammaStamper, or as I refer to her, Little HM, has gone away today. I think she must have scratched the furniture because she had to get an operation like I did 2 years ago. This time though, Big HM tells me it’s the knees. Her claws are totally useless so I don’t understand why the operation but I didn’t understand mine either, so go figure. Oh yes, if you’re wondering: I understand what Big HM says; most of us understand what all creatures say. Trouble is he can’t speak Cat so I have a lot of trouble communicating with him. And with my vocal cords as they are, try as I may, speaking Hairless Monkey is just not an option. Typing is okay though. I often attempt to type a letter to him while he’s on the computer but he just pushes me off the keyboard. What a dullard! I mean, I know HMs aren’t noted for their intelligence but this one … well, let’s just say that pizza came without anchovies, if you know what I mean. Little HM is doing fine. The operation went well, lasting from 9:00 am to 12:45. The surgeon told Big HM that her bones were “practically fused together” and that it was difficult but 100% successful. I, of course, was left here alone all day and only now is Big HM back. She’s resting at the hospital and hopefully has a good sleep, filled with dreams of catching birds and warming herself in front of the fireplace. Big HM tells me things went well in no small part due to the love and prayers from all you reading this. I’m planning an invitation card; maybe a pop-up thing but again, no opposable thumbs and Big HM is well … like I said, he’s not exactly dextrous, so I expect I may have to make it on the computer. I’ll let you know tomorrow. I'm telling you, ladies, stamping has saved me from becoming overly anxious about tomorrow's surgery. Well, that, and the prayers people are saying for me and all the positive thoughts coming my way. I really can't thank you all enough because I can honestly say that I'm relatively calm, with only moments of anxiety here and there, which is perfectly normal, I'm sure. However, once this post is complete, I'm laying down my markers, stamps and papers because I've got laundry to do and a bag to pack. As of tomorrow Thursday, my wonderful husband will be posting here for me to let you know how I'm doing. The easy part is the surgery, the hard part will be the physiotherapy, but everyone, without exception, has said it will be well worth it. I'm hanging on to that. So, here's my card for today. It was made following a tutorial by Charmaine at Oodabug Alley, but it's really a card that will be entered into the Blog Contest posted by Shannon at Live, Love, Laugh and STAMP. The colours that are required are Tempting Turquoise, Almost Amethyst and Black. I hope I win because I love those Riley moose stamps. C'mon, Shannon, take pity on a poor, old woman who won't be able to walk for a couple of months. Just kidding, I'll be in line with everybody else for the prize. This is Barb, signing out until somewhere around March 4th, but please drop by to see what John has to say. Leave him a comment to encourage him to do it again and again. He'll get to love blogging as much as I do. More play time for me today, yeah! 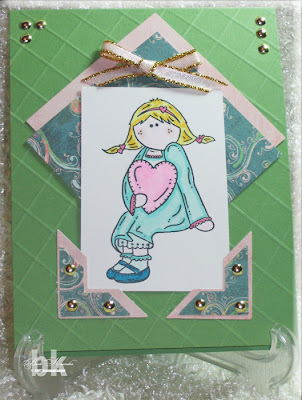 Both of these cards are going to be entered into Kraftin' Kimmie's Kreation Celebration Challenge #6. This has been so much fun and I want to thank Kimmie so much. The card on the left is, of course, one of the latest Elzybells stamps. I decided to make it a Thank You card. I can just imagine that I've had the bestest weekend with my BFF and I would send this as a thanks to her. Again, I think this layout is original, as I didn't have any kind of sketch in front of me when I did it. I coloured the image with my Copic/Ciao markers. I now have Set A, Set C and I'm in Gina K.'s club for Set D. Where or where is Set B. That is a very elusive set, indeed. However, if you are a member of The Stamp Shack, there's going to be an announcement soon about one of the e-Bay stores that is going to make special arrangements for Shack members. I'll post here again when I know more. The card on the right is another of Elzybells new release. This is a thinking of you card. I think I would send this to my both of my DS' as a gentle reminder to CALL MOM! Well, maybe not so gentle, but it gets the message across. This card uses the sketch from Holly at Toy's Haven. It's a sweet sketch and I thoroughly enjoyed making this card. It was my first visit to Holly's blog, but it won't be my last. I'm going to add a link to the blogs I visit so I won't forget where it was. Thanks, Holly, for a terrific sketch. With two days being eaten up with hospital visits for pre-op stuff, I've been missing my crafting time. I finally just said I'm going to my craft room and not getting up until I've had my fill of playing with my goodies. Over the past week I've received new Elzybells stamps and some gorgeous Sugar Nellie stamps, too. I'm still waiting on new Hanna Stamps, but I guess Kristi will be mailing out the orders when she returns from CHA. So, Hanna, the Domestic Goddess, will have to wait until I come home. In the meantime, here's this sweet little charmer with her heart in her hands from Elzybells. This card will serve as an entry for two challenges. The colours are for The Stamp Shack Colour Challenge #6. The colours in The Stamp Shack challenge were to use bright pink, bright green and yellow. And, I just happened to have feathers in those colours, too! I love this little "bossy" lady. She reminds me of one of my kids, who is a self-professed 'control freak'. Her words, not mine! I'm just repeating them, I don't necessarily agree with them, Tiffany. 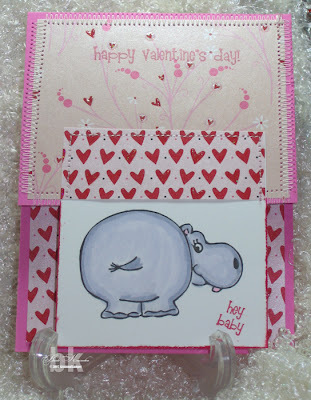 The layout of the card is for the sketch challenge at Kraftin' Kimmie's Korner. 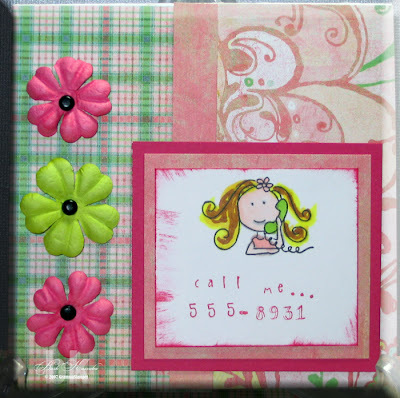 This was a terrific sketch and I decided to make my card 5-1/2" square. I can't mail it to anyone until I get some 6" x 6" envelopes as I'm all out of that size. Thanks, Kim, I'm going to try to complete a couple of more before Monday, too! They are such fun. Up next is my Knight in Shining Armour! It was so funny because a few weeks ago, I was in the Dollar Store and I found these cute embellishments for knights, dragons and such. 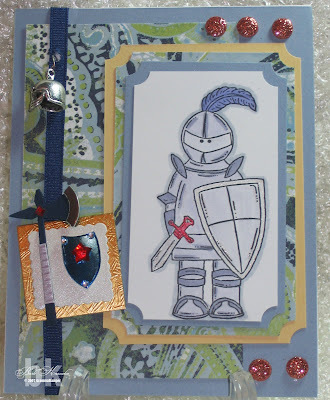 I bought two packages and lo and behold, Sugar Nellie comes out with new stamps and one of them is this Knight. Well, I had to have it. Wouldn't you? It was like a message from above saying this is your stamp, go get it girl. Not being one to argue with 'the messenger', I promptly purchased him and now he has a new home. Actually, I'm dedicating this to my DH, John, 'cause he's going to look after my blog while I'm in hospital and give you updates on my progress. Here's to Sir John! Oh, and aren't those Glitter Dots just the cutest. I got them with my last order from Gina K. Designs. Hurry, go get some. And finally, we have this little darling from Sugar Nellie who is carrying around her heart. How sweet is she! 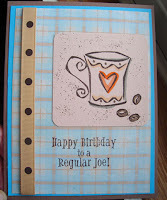 On this card, I decided to use my Scor-Pal for the background on the card base. I've been wanting to try this ever-so-easy technique for some time now and today was the day. To the best of my knowledge, this layout is my own. I do not recall seeing anything like it before, but if someone has done it, please accept my apologies for claiming it as my own. I thought it up today. Anyway, after the cross-hatch background was done, I didn't want to cover it completely with patterned paper, but I did want to use something more. So, out with the Two Scoops, the SU photo corner punch, ribbon and a pile of gold brads and here she is, all dressed up and ready to be mailed. Okay, that's it for today. I'm hoping to get more done tomorrow, but time will tell. See you then. Congratulations, Denise, for winning the fifth and final round of BINGO. You may have already received your Gift Certificate from JessicaLynn Original, or if not, you soon will. I have thoroughly enjoyed hosting this BINGO game and wish to thank you all for such marvellous participation in sending in cards and the wonderful comments you all have left. Also, I appreciate that you really stepped up and made it possible to have this game completed well before I have to go into the hospital next week. It was great. I hope to have some time to get some cards posted here before I go in, because once the surgery takes place, I'll be in the regular hospital for 3 or 4 days, post-op, then I'll be moved into St. Joseph's Care Group Hospital, here in Thunder Bay, for a minimum of two weeks. I'm packing a bag of crafting supplies, but don't think I'll be able to post from there. 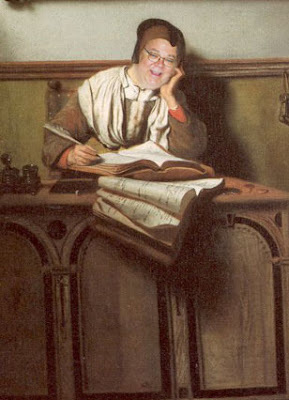 The good news is my darling husband, John, is going to update my blog with my progress. Everytime he talks about it, he gets this goofy gleam in his eye. He has something up his sleeve, but is not willing to share with me just what it is. He has a very good sense of humour, and I'm sure you'll get a chuckle out of his posts. I've tried to talk him into making a card or two just to keep it interesting, so, please encourage him when the time comes. Today I'm off to the hospital for pre-admitting procedures such as blood work, x-rays, whatever else they can think of and probably an overview of what to expect during my stay there. All I really expect is pain and drugs to control it. Lots of drugs! If anything interesting happens, I'll post about it. If not, maybe I'll get time to make a card tonight. See you all later and, once again, thanks for making this BINGO game so much fun! I made a mistake and the BINGO numbers were posted for about 30 seconds, at 12:01 pm EST. I removed that post and am waiting for 1:00 pm, as stated. So, the first person to call BINGO after the post appears will be the winner! I am so sorry for any confusion I caused, but the official post with the numbers for today is the only place to post BINGO! There is a ton of numbers to call again today. According to my records, we're getting close. Because we are getting close and there are so many numbers to call, I'm going to postpone the posting of the numbers until 1:00 p.m. today. This will give everybody in all time zones an equal opportunity. The first person to call BINGO will be the winner! Also, I can't accept any more cards from you wonderful ladies for this post. I have all I need. Sorry to make you wait, but I think it's only fair to give everyone the same chance. Really, this set was probably named after me! I love it so much and here's yet another card with the cute little (?) hippo, this time. I must say, Melanie Muenchinger has made a great set and I can't wait to see what her next designs will be. BTW, check out the Contest by checking the rules here. If you've got the Just So Hippy set, you can enter. This is a card I made for DH. We are always saying, "Hey, Baby" to each other, so this sentiment and the hippo just worked for me. You can buy this set from Gina K. Designs. This style card has become popular of late and I wanted to give it a try. 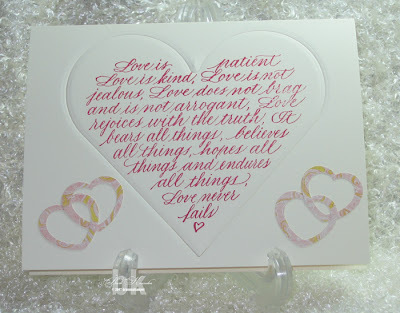 And, I love the Heidi Grace designer paper which I bought while attending MOA last September. Imagine, I still was able to find it. Absolutely amazing! I used machine stitching and went very slowly and carefully and this has been my best effort at machine stitching so far, I think. It's straight, even and, well, good, for me. I coloured the hippo with Copic markers, of course. My lovely daughter, Kirsten, came into this world 35 years ago today. I know she won't mind me saying her age, because she announced my age to all my office co-workers several years ago, when I was 49 years old. As Kirsten will come to realize, children love to say things like that and she has all of that to look forward to because she is a wonderful Mom to Owen, 18 months, and is also expecting her second child in May. Happy Birthday, Kirsten. I hope your day is splendiferous! OMG...this post is going to have tons of numbers for BINGO today. Thanks to everyone who submitted their cards for extra numbers. Let's get right to it, shall we? B 5 - Shannon T.
B 9 - Shannon T.
This is what came about when I wanted to play around with the Gina K. stamps designed by Melanie Muenchinger. It's the "Just So Hippy" set. 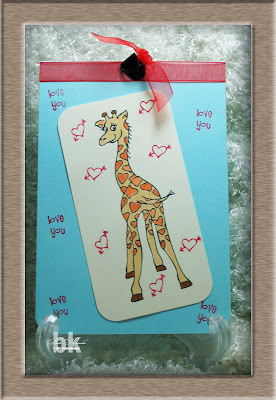 I love the giraffe and thought he'd make a great Valentine's Day card for my grandson, Jack, who is 18 months old now. My goodness, how time flies! I had a short conversation with him on the phone the other day and didn't understand a word he said, but he sure did. There's the right inflections and intonations when he speaks and soon, we hope to understand him. But for now, just hearing his voice is a joy. Same thing with my grandson, Owen, in England. I talked with him yesterday (his card was mailed last week and can be seen in a previous post), and he said 'grandma', 'teddy', 'football' and just laughed so sweetly. His Dad is a huge Arsenal fan and 'football' translates to 'soccer' in North America. 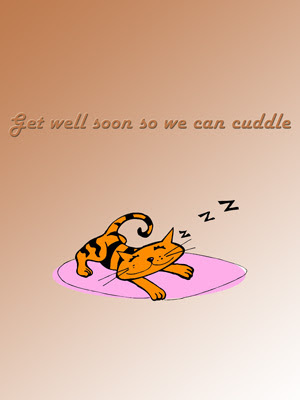 Anyway, this is the card for Jack. Apparently, when I start thinking and talking about my grandsons, I get totally carried away and off-track. Back to cardmaking. 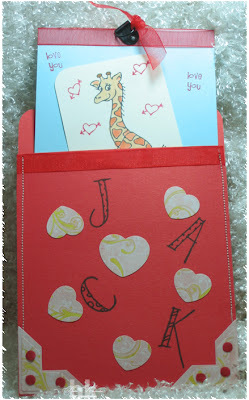 I saw a pocket card on Alex's blog and thought it would be great for Jack. I kept the bulky embellishments to a minimum because it has to go through the mail, but when I live closer and can hand deliver, I will really go to town. I did some sewing along the edges, added some photo corners using my SU punch (love, love, love it), punched out a few hearts with the CM heart punch, stamped his name on the front, added ribbon along the top. What you can't see, is behind the giraffe which is just sticking his head out in the photo on the right, is the sentiment 'happy Valentine's day! ', from the same Just So Hippy set. It all works together beautifully! ....you miss someone's birthday. Well, I missed my soon-to-be BIL's birthday. It was January 25th. In all fairness, my sister didn't tell me it was George's birthday until I saw a picture she sent me and there he was, cutting a birthday cake. So, I had to make a card lickety-split. 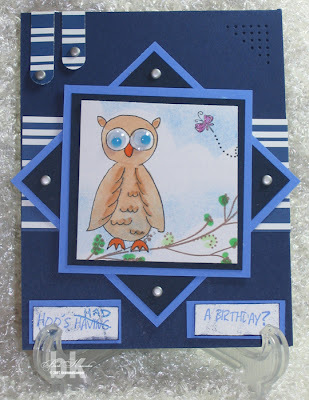 I really liked the sketch for the Verve Visual: Honored Guest Designer Challenge Contest, and, I had an extra owl ATC left over from my swap, so I married the two together. Voila, almost instant birthday card. Please, hold the applause, I'm sure I'm not the first crafter to have thought of this idea, but man, was it quick. If you noticed at the beginning of this post, I said "soon-to-be BIL". Yes, my sister, Shirley, and George are going to be married on February 17th. It's a huge day because it's her birthday, my daughter's birthday, and now, their Wedding Day. 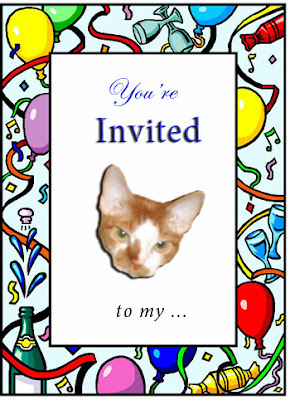 I'm really sorry that I'll miss the big party because of my surgery, but here is the card I made for them. I hope they like it. I tried to keep it elegant because my sister is just that sort! At least I think so. Finally, some cards and pics! Here's the card for SIL. 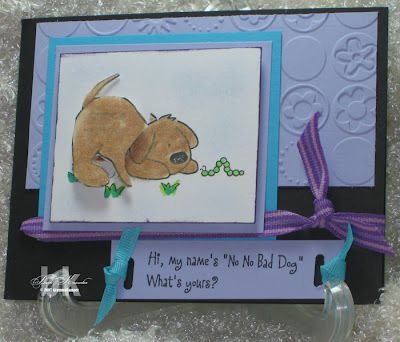 I used my newest set, "You know you're old when....." by Gina K. Designs. This set is a must have for all of you. It is so versatile and funny. Of course, the front of the card doesn't make sense unless you read the inside. I actually found a tutorial that was terrific for sewing on cards. It is by Julia Stainton and was posted on her blog, Belle Papiere, quite a while ago. I just saw it today. You can read it here. 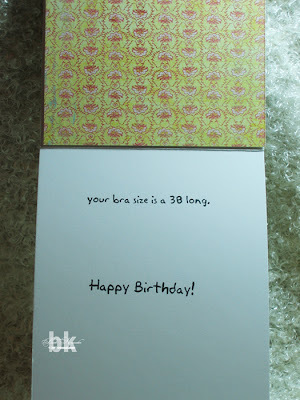 This card, however, also inspired me. Of course, I already had completed my card when I saw this one, but, never again will I throw out my 'goof-ups' and I can only hope that they turn out this cool. I love Cammie's attitude regarding this card. 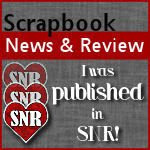 Here is the ATC I made for the swap. It's my last swap before going into the hospital and I'm really glad I finished it up so I can pop it into the mail tomorrow. 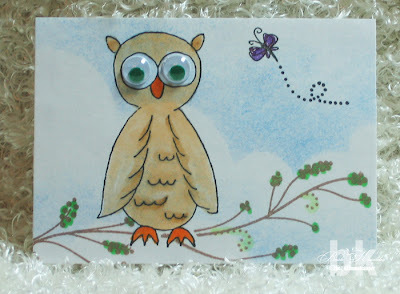 I just realized that the owl is from the set by Carolyn King (Cammie) which is also offered by Gina K. Designs. Seems I'm a bit addicted to Gina K.'s stuff. I'm not complaining about it. My addiction could have taken a completely different path, so I'll stick to rubber stamping and paper crafting, thank you very much! The ATC uses the masking technique and three different stamping companies. OMG.....still no picture for today. I can't seem to get into my creative space lately. I think I'm trying to figure out all that I have to get in place before my surgery and it's doing my head in. Today, I think I'm just going to take a deep breath and just forget about it for a bit. Maybe we'll go to the movies or something, just for a change of pace. Anyway, that's enough of me whining, on to the BINGO numbers. Stampin' Up! images, Stamping Bella images, cards/items you make for any challenge, Gina K. images and, lastly, anything you make, either a card or an altered item. The last category is extremely broad, but it's necessary. There are some really beautiful creations listed above. Please check them out 'cause you never know where your next idea may be born. Have a great weekend, everybody!